A Gift or an Achievement? Color your Music with Perfect Pitch! Ear training is the fundamental practice to establish a basis for skill, knowledge and appreciation in music. The importance of ear training with respect to music can never be underestimated, because music is a hearing art. A child can never start ear training at too young an age, because ear training means simply LISTENING -- nothing more, nothing less. A child who learns to listen at a young age has a precious advantage which lasts a lifetime. And the parent or teacher who helps a child to listen becomes responsible for a clearer perception that cannot be bought nor can any amount of musical study ever replace. In the infinite subtleties of music -- whether rock, classical, jazz, or other style -- the ear must be able to quickly “unlock” the chords and melodies it hears in order to understand and appreciate the music and try to find proper expression for each tone. A performer can perform only as effectively as he or she can hear. A composer likewise can compose only what his or her ear can comprehend. Even the casual listener can enjoy music only to the extent that his or her own musical awareness permits. Simply put, everything about music is utterly dependent on how well the ear hears. A good ear means a good sense of pitch, because music is composed of individual pitches. Good pitch is considered by professional and amateur musicians alike as the most vital factor for success and enjoyment of the “hearing art.” There are two basic perceptions of pitch: Relative Pitch and absolute pitch (or “Perfect Pitch”). Relative Pitch is the ear's awareness of space between pitches. The distance from C to G, for example is called a “perfect fifth” (five scale tones are encompassed in this space -- C, D, E, F and G). It's the same distance from C sharp to G sharp, or from D to A, or from E flat to B flat. When any of these pairs is played -- two tones together or one tone after the other -- a certain quality of sound is created which is different from all other pitch distances (such as a perfect fourth, major third, or minor seventh). Relative Pitch is the ear's ability to quickly recognize these relationships between tones by their sound quality. Perfect Pitch, on the other hand, is the refined perception of color within individual pitches. By becoming sensitive to subtle sound colors which most ears miss, the musician who has gained Perfect Pitch can identify the actual names of tones just by listening. Perfect Pitch tells you the key a song is in by simply hearing it on the radio. When someone asks you to sing an F sharp, Perfect Pitch allows you to recall and sing that tone at any time solely from memory. It is a completely different and much more highly refined level of hearing than is commonly experienced, which puts a musician at distinct advantages from all sides. By culturing the ear's awareness, any child or adult musician can develop Perfect Pitch by doing easy listening drills until the skill is naturally established. 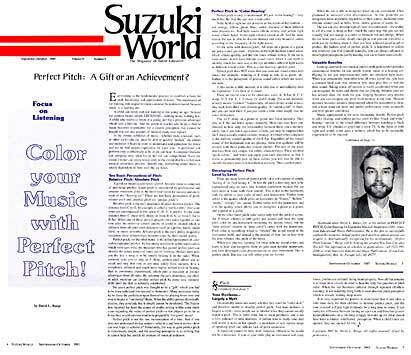 For years Perfect Pitch was thought to be a “gift” which you had to be born with (and few seemed so fortunate). Many musicians today try to force the perfection upon themselves by playing tones over and over in hopes to “memorize” them. When the ability proves chronically elusive, they conclude that it simply cannot be developed. The frustration incurred has been the source of doubts arising within some musicians regarding the value of Perfect Pitch -- a few players go so far as to say they would not even want to be plagued by “too good” an ear! Perfect Pitch is not the raw memorization of a tone. And if one does not understand its true nature -- what it is and how it works -- how can one hope to achieve it? Fortunately the way to gain Perfect Pitch is ridiculously simple, and the resulting perception is so striking that it cannot help but enrich all avenues of musical endeavor. Perfect Pitch is easy to understand. It's just “color hearing” -- very much like the way the eye sees visual color. In the field of sight we can perceive all the colors of the rainbow -- red, orange, yellow, green, blue, violet -- because of their difference wave frequencies. Red light waves vibrate slowly, and yellow light waves vibrate faster. Violet light vibrates fastest of all. And for some reason the eye is able to discern distinct and very beautiful colors according to the frequency of the light waves. It's the same with musical pitch. All tones on a piano or a guitar are just a sound spectrum -- the tones at the high end have sound waves which vibrate quickly, and the low tones vibrate slowly. If the ear is wide awake, it will hear delicate sound colors which it can learn to identify, much the same way as the eye identifies different light waves as different visual colors. This is color hearing -- Perfect Pitch. Perfect Pitch does NOT mean that you associate visual colors with tones -- for example, thinking of F sharp as red, G as green, etc. Rather, it is the perception of precise sound colors which are heard, not seen. If this seems a little unusual, it is only due to unfamiliarity with the experience. Let's look at it closer. There are twelve tones in the chromatic scale: A, B flat, B, C, C sharp, D, E flat, E, F, F sharp. The word chromatic actually means “colored.” Surprisingly, all tones do not sound alike -- they each have their own distinct quality, or “sound color” to them, and you can hear them if you just listen a little more deeply into the tones themselves. There are many levels of Perfect Pitch -- it is not a matter of simply “having it” or “not having it.” At first the pitch colors may start to be experienced only on one's own familiar instrument because the ear feels more at home with these sounds. This is due to the familiarity with the timbre or tone color of one's own instrument. Timbre (tone color) is the quality which gives an instrument its “brassy,” “hollow,” “reedy,” “stringy,” etc. sound. Timbre varies with the instrument, and it is the quality which allows you to recognize a piano, as a piano, and a guitar as a guitar. On the other hand, pitch color varies only with the pitch of a tone. An A which vibrates at 440 cycles per second will have the same pitch color on any instrument (including the human voice), but the “tone texture” (timbre or “tone color”) varies with the instrument. Pitch color is something which is “beyond” the actual sound of the instrument itself, and instead is the product of how fast or how slow the tone vibrates (the pitch of the tone). When you practice listening for these delicate sound colors and learn to hear and recognize them on your own familiar instrument, you have developed color discrimination on your instrument. This is Perfect Pitch. But you can still refine your ear further. When the ear is able to recognize tones on any instrument, it has graduated to universal color discrimination. At this point the ear recognizes tones anywhere, regardless of their source, including more obscure sounds such as bells, birds, sirens, glasses of water, etc. The ear can also develop refined color discrimination -- the ability to tell if a tone is sharp or flat -- much the same way that you can tell visually that red-orange is a color in between red and orange. When the ear hears pitch colors clearly enough so that you can remember a pitch just by thinking about it, then you have achieved aural recall of pitches, the highest level of Perfect Pitch. It is important to realize that wherever you find yourself naturally, you can always advance to these higher perceptions just by training your ear to listen more closely. Gaining command over musical pitches with Perfect Pitch provides valuable benefits for one simple reason: music is a hearing art. Playing by ear and improvisational skills are advanced light years. When you permanently remember what all tones sound like, you have a constant head start over someone who must play first to find out their sound. Taking music off records is vastly accelerated when you can recognize the notes and chords that are playing, because your ear has already done the work for you. Singing becomes very precise when you can compute any pitch from memory at any time. Musical memory becomes securely programmed when the perception is clear, and a laser sharp ear tunes and guides performance more accurately and with greater confidence. Music appreciation is the most fascinating benefit. Perfect Pitch is color hearing, and without Perfect Pitch it's like “black and white” hearing -- similar to the visual difference between watching a black and white TV (shades of gray) and a color TV. In the fields of both sight and sound, color adds a richness which has to be personally appreciated to be enjoyed. Occasionally musicians worry whether the could be “color deaf,” and therefore unable to develop Perfect Pitch. True tone deafness is largely a myth -- most people are so labeled when they cannot vocally match a pitch. This is more often due to vocal problems, and is not a firm indicator of tone deafness. A person who is truly tone deaf will reveal it in his or her speech -- a monotone or very narrow range of speaking pitch can indicate lack of pitch awareness. A musician cannot be tone deaf, however. Otherwise he would not be a musician. If you or your child play an instrument and enjoy music, pitches are certainly being heard properly. Now all that remains is to listen more closely in order to hear the very fine qualities of pitch color. When the ear becomes cultured through repeated effortless listening, it will naturally bring forth its own absolute pitch perception which is already waiting deep inside. It is very important for parents to understand that it just takes a little time daily for their children to develop Perfect Pitch, and the time invested will pay high dividends for a long time to come. It can make the difference between having an open ear and therefore greater accomplishments, or a life-long struggle to make up for what should have been a natural, established, perception. When a child's ears are opened, they are opened for life. Keyboard artist David Lucas Burge is the author of the Perfect Pitch® Ear Training SuperCourse (1981, American Educational Music Publications). He is the first to successfully explain the mysteries behind Perfect Pitch and how almost anyone can acquire it. Internationally recognized for his revolutionary “Perfect Pitch Seminar,” Burge will be touring the greater New York City area this fall.